Each of the four Tarot Queens in this empowering year-long system represent an archetypal part of our personalities as well as our experience of being human. Detailed explanations of each archetype, and workbook-style exercises and practical tips are provided for aligning with and balancing the energies of each Queen. 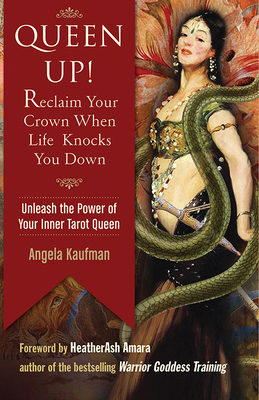 The Queen Up system blends various metaphysical teachings and psychological concepts to empower women to navigate life's most challenging situations. In part one, the basic tenets of the system are reviewed; part two introduces us to the four Tarot Queens that embody the essential qualities for creating wholeness, and readers will be taught how to access their energies as well as look at common obstacles; and part three provides a year's supply of weekly exercises to help readers develop intuition and manifestation. The Queens serve as a symbol of the potential of every woman. Angela Kaufman helps readers unlock this potential to harness and express their dream lives. Angela Kaufman is a lifelong seeker of spiritual connection with a background as a clinical social worker and certification as an intuitive consultant and psychic medium. Angela has coauthored several books including Sacred Objects, Sacred Space: Everyday Tools for the Modern Day Witch. She is a frequent contributor to holistic publications including Healing Springs Journal, The Magical Buffet, and Natural Awakenings. Visit her at www.intuitiveangela.com.